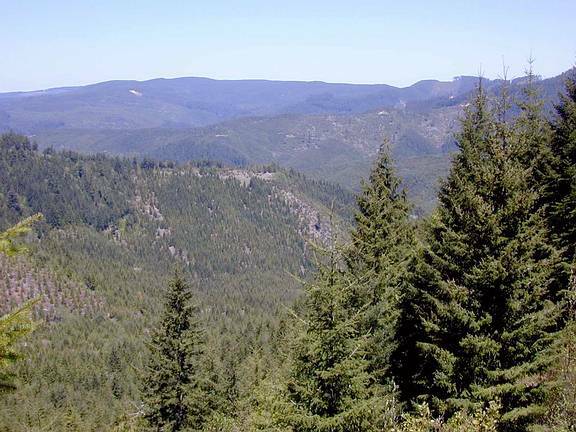 The Calapooya Divide in Oregon seperates the Umpqua River valley from the Willamette River valley. The paved road BLM 23-1-13 runs along a section of this ridge. 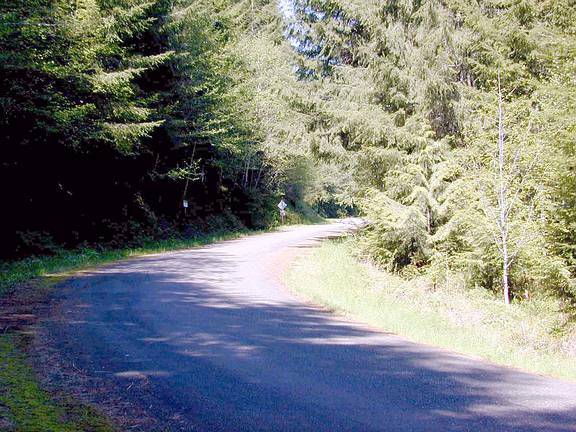 Together with some connecting roads, this makes a nice 70 mile loop ride from the Cottage Grove area. 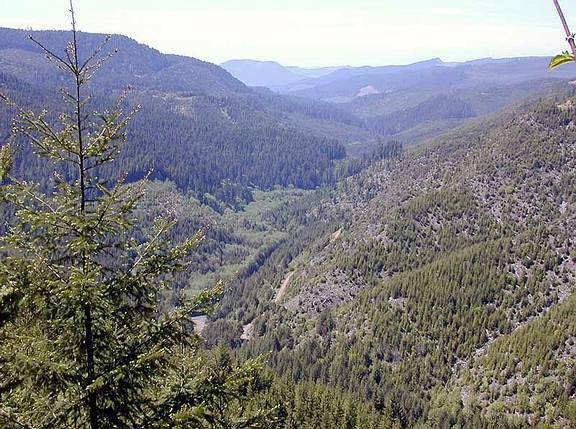 While the highest point on the loop is only 4400 feet, when taken counter-clockwise, about half the climbing is in 5 miles. My first attempt at this loop in 1999 was on April 24. I turned back after climbing to 3400 feet. The road was covered with snow. My second attempt of the year was on May 23. Proceeding up Big River Road I noticed a different mix of flowers blooming from my April ride. 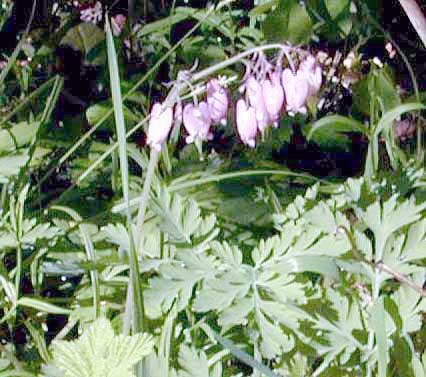 Among them were bleeding hearts, plenty of purple irises, and even a white iris or two. 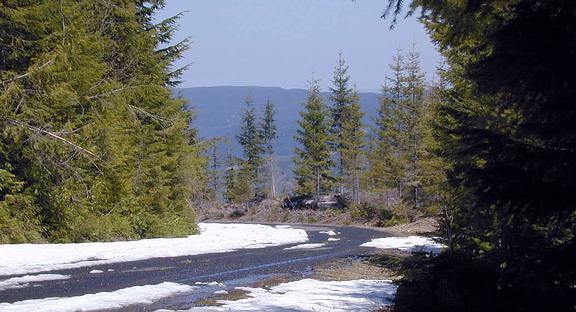 A right turn from Big River Road onto BLM Road 23-5-5.4 is where the real climb begins. After climbing 900 feet in less than two miles you can look back to see this. Uh oh! Three miles yet to the top, and the road is covered by a foot of snow! It's at about 3560 feet this time. Well, I guess it's time for lunch, a quick shot of the transportation, and then turn around and go back the way I came. Here's a shot or two on the way back down. The third attempt was on May 30. 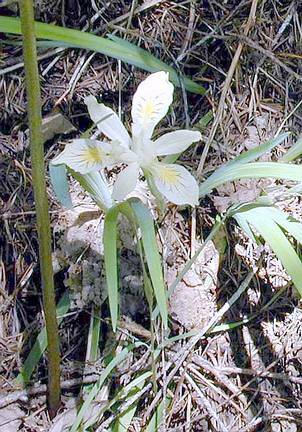 The warm weather of the last week has brought out many more of the white irises. 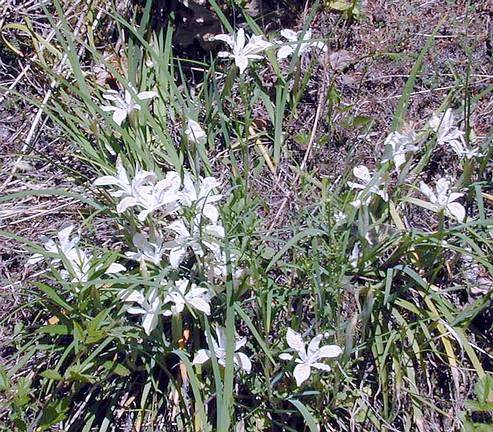 In places the bank by the road is sprinkled liberally with them. 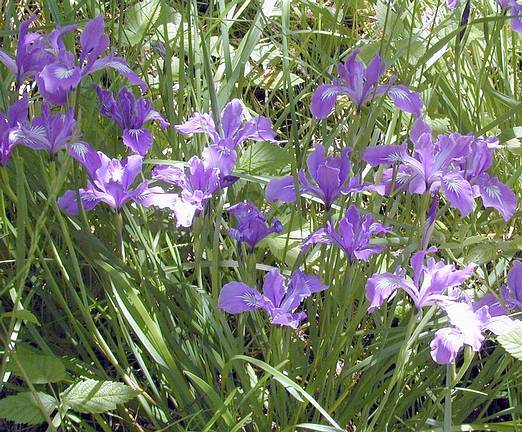 I think the white ones are slender-tubed iris (Iris chrysophylla), and the blue/purple ones are Oregon iris (Iris tenax). Well, I got about 3/4ths of a mile further this time before running into snow. About 3900 feet this time. 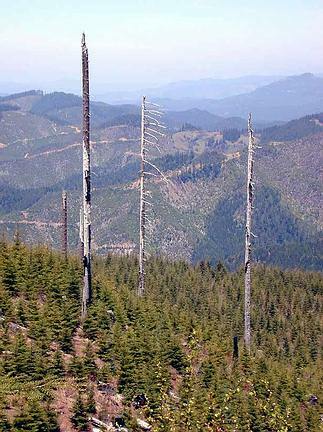 Standing down below in the replanted clearcut are these snags. Time for lunch again, and then the descent. 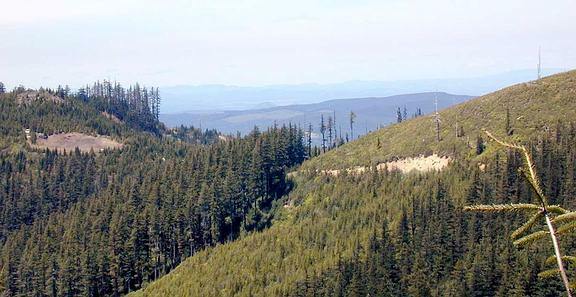 When I got back down to Big River I turned to the right, as I had never been beyond the Divide turnoff before. After a short distance the paved road veers to the right, paralleling 23-5-5.4. While it's a bit of a grade, it doesn't start out quite as steep. It's also shaded by some good sized second growth trees. By the first switchback it's back out into the sun. 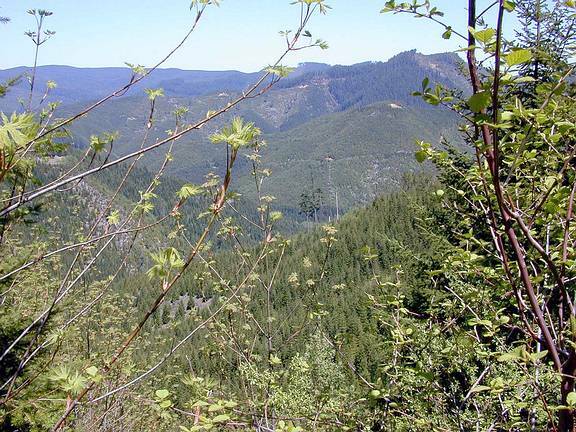 At the second switchback you can look back down the Big River valley and see this. June 13: At last! I made it all the way around! 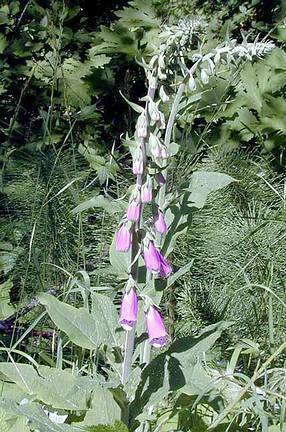 Along Big River some foxglove was already blooming. 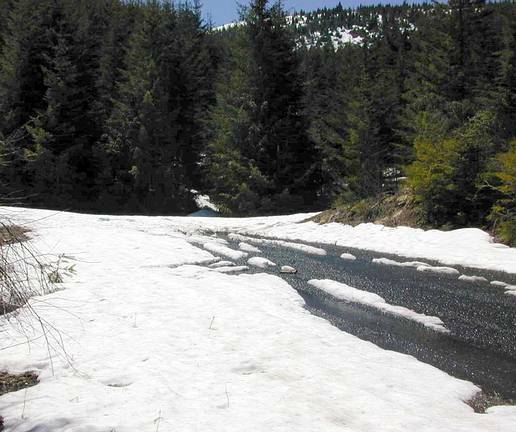 I ran into snow at 4100 feet, where the road levels off for a bit after climbing pretty steadily for about five miles. 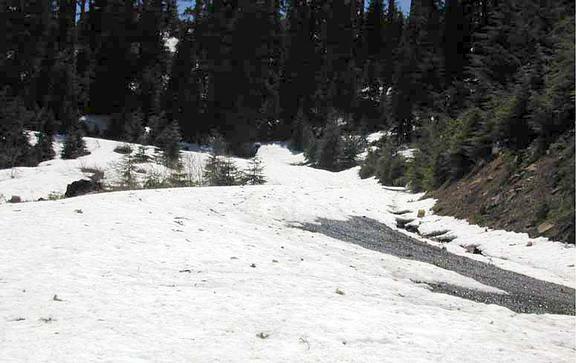 I skirted around the snow, scrambling through bushes and berry vines. After about a quarter mile of this, the road was clear again for a ways. The road just past the quarry was thick with Doug fir needles and cones. No one had been on this stretch since last fall! A bit further up the hill I ran into snow again. There was no way to go around it, but I found that it was firm enough to walk on. 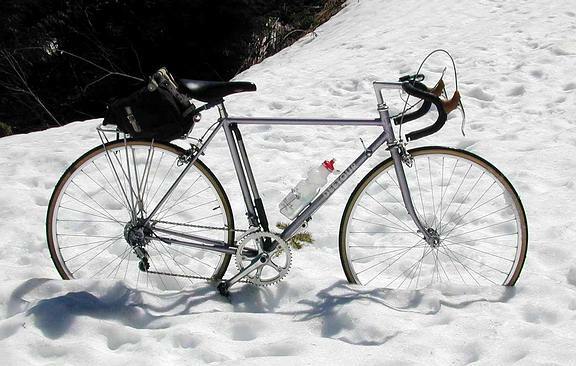 It was pretty slow going, pushing my bike uphill over the snow. Here's a view from the summit. When I was at the top, eating my lunch, some motorcyclists came up from the other way. They decided to go back the way they'd come! The other side has good southern exposure, so it clears up sooner.